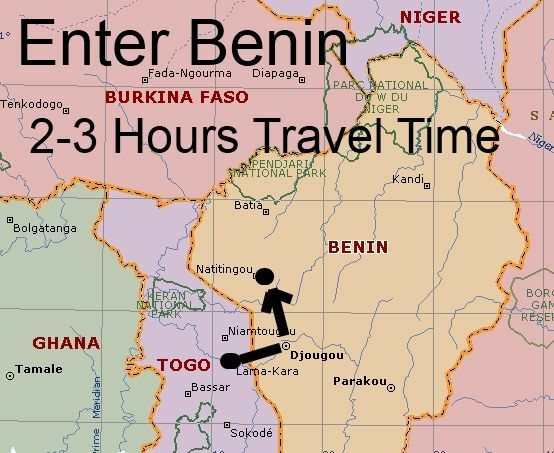 2013 December 3 Entered Benin Leaving Togo - Where Is Andy Graham? The plan is to live in 2-3 cities, sharing time between the cities; therefore I left Kara, Togo for Benin. Outfitting an extremely large two bedroom apartment requires a lot of furniture, and even though I am only paying 70 dollars per month rent, it is tempting to be unwise, and pay big money for furniture, but not me, somehow my temptation button is killed, in many ways, it does not work. Maybe it is because I am a recovering alcoholic, and after 27 years of not drinking, I am incapable of listening when bait is put in front of my nose. Benin, Africa is more organized than Togo, the roads are great, often four lane, with mediums, and curbs. While Togo is two lanes with pothole, yet strangely the homes in Benin are poorer, more red brick. As, I was riding along in the car, I saw two men making bricks in the field next to me, and I thought to myself there is more red clay in Benin. It could be, that there are more mud homes, because the red clay is here, and not in Kara. Kara is built on a rock, there are huge rocks coming out of the ground in Kara. We all use the cheapest, best materials close to our culture to build homes, and truthfully, a clay home is good for maybe 20-30 years if plastered, painted, with a good roof. Adobe sounds like mud, but truly most is red clay, like a pot, if they heated the stuff, they can make into the red bricks. Adobe is just one step below the furnace baked bricks. Yesterday, my mother wrote me, wants me to explain what I am doing, and why, whatnot, it sort of hurt me to know that I have somehow sucked up to Google, and readers, and no longer do I have a travelogue, it is just a bunch of articles trying to be a travelogue. I try to weave them together, but it is not possible. A travelogue jumps from idea to idea, in sequence of events. Truly, I blame this on Google, and my need to make money using the Google adsense system, if I do anything that is less than stupid, they do not pay me, they can only sell ads on stupid, simple, and mundane, anything longer than a 3 minute sound bite, that is not NEW, no longer gets traffic. It is just a big social network, and if you do not read in 10 minutes, it is gone forever. In defense of Google, they are no longer capable of indexing the whole internet, or showing good pages. They had to make a decision to make money, or make intelligent, and money won. I am doing the same when I write articles for Google, and not a travelogue, I know many long-term readers like the travelogue, but they are not willing to pay for it, because the internet is just a form of entertainment, and this is OK. I understand, why pay on the internet, I can steal movies, books, everything is stolen, to pay is sort of silly when everyone just puts huge amounts of information up free for the taking, free is standard. They are going to stop free by using the cloud, and make people believe they are happy. Lonely Planet really got too stupid, when they started giving away book in digital formats; I expect them to go out of business. In many ways, I believe that digital guidebooks are suicide. And the truth is, digital devices just do not work when getting off a bus in the middle of chaos. We can throw a book down on top of a push cart, and allow all the locals to see it. I said hi to many friends yesterday here in Benin, my hotel is great, other than a bunch of 27 year old French volunteers stayed up all night drinking, they are still there drinking, and it is 5:47 am. It is amazing how bad of an example the volunteers are in Africa, they drink, party, and drive around in cars, completely unaware there is example is of a life that is not real life in France or the USA. We do not get to drink all night on Tuesday night in the USA, but volunteers can, because if they do not do their job, nobody cares. I think about this daily for my malaria project, it feels to me, that sustainable development is only when it is profitable for people. I mean, we can make window screen businesses, which make money, and stop malaria mosquitoes from entering. We can make selling bed nets profitable; most problems with malaria are simple, like cleaning the sewers, or having screens on windows. While the ivory tower people think pandemic solutions, as if God is going to come, grant them the one solution that solves all small problems. Oh well, I am in Benin, it is nice, more tribal, more modern, and more food. The more food part is good. I purchased a big bottle of black pepper yesterday, I will buy 4-5 of them before I leave, not one place in Kara, has black pepper. Sadly, the supplies of products are only highly profitable, if everyone in the village does not buy, then they do not sell it. I believe this is why there are no mosquito nets for sale in Kara, why sell something and make 50 cents, that is wanted, not needed. It is needed for the long-run. Well, it is nice to have new locals, new faces here in Benin, West Africa. I feel stupid telling people which continent a country is located.